This Grapevine Star Wreath is approximately 24" wide. 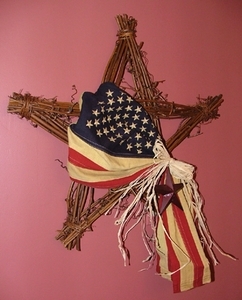 It proudly displays this high quality stitched and embroidered Antiqued American Flag. A must have for every Americana Lover! Part of the J. Cranford Collection of Handmade decor. * This product is made when ordered, may take approximately 1 week until order ships.